Haley (and her Dad) have been hard at work on our Café Press T-shirt shop. We’ve expanded a bit. 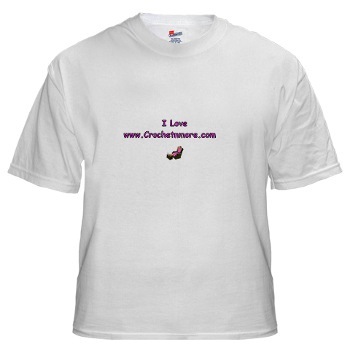 We have a crochet t-shirts section. Just click on the design you like. 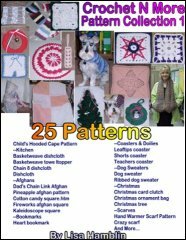 We also have crochet cups, mugs, aprons, and totes. Some crochet stuff for your baby (bibs, onesies, etc). Just in time for valentine’s day we have hearts . We’ll be expanding and putting up more designs in the months and weeks ahead. And Haley wanted me to say thank you for all those who have bought things and visited. 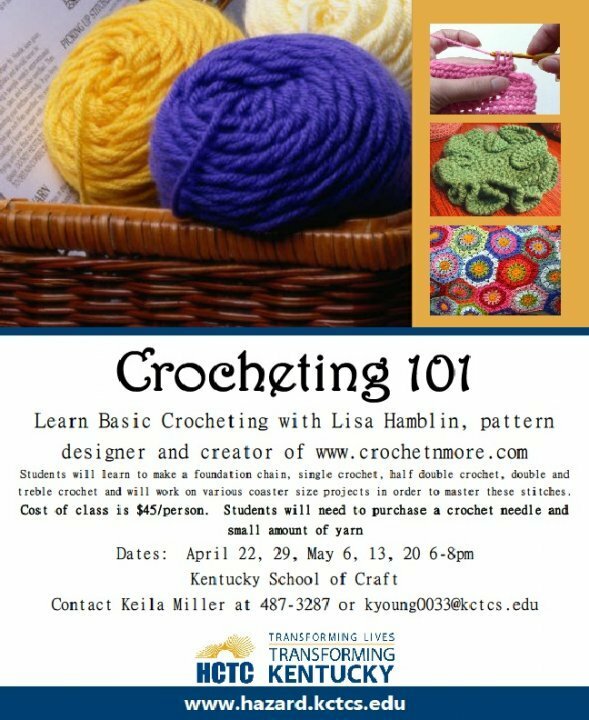 I will be teaching a class on how to crochet at a local college. i am trying to make circle for a smiley pattern and its only about 4 rounds but i can not get the main circle beginning chain to get tight. i pull and pull and it just comes loose. can anyone help.. please email me with suggestions. The Lord is my shepherd, I shall not want. He makes me lie down in green pastures; He leads me beside quiet waters. He restores my soul; He guides me in the paths of righteousness for His name's sake. Even though I walk through the valley of the shadow of death, I fear no evil; for thou art with me; Thy rod and Thy staff, they comfort me. Thou dost prepare a table before me in the presence of my enemies; Thou hast anointed my head with oil; my cup overflows. Surely goodness and lovingkindness will follow me all the days of my life, and I will dwell in the house of the Lord forever. Brethren, even if a man is caught in any trespass, you who are spiritual, restore such a one in a spirit of gentleness; each one looking to yourself, lest you too be tempted. Bear one another's burdens, and thus fulfill the law of Christ. For if anyone thinks he is something when he is nothing, he deceives himself. But let each one examine his own work, and then he will have reason for boasting in regard to himself alone, and not in regard to another. For each one shall bear his own load. And let the one who is taught the word share all good things with him who teaches. Do not be deceived, God is not mocked; for whatever a man sows, this he will also reap. For the one who sows to his own flesh shall from the flesh reap corruption, but the one who sows to the Spirit shall from the Spirit reap eternal life. And let us not lose heart in doing good for in due time we shall reap if we do not grow weary. So then, while we have opportunity, let us do good to all men, and esepecially to those who are of the household of the faith. Since then we have a great high priest who has passed through the heavens, Jesus the Son of God, let us hold fast our confession. For we do not have a high priest who cannot sympathize with our weaknesses, but one who has been tempted in all things as we are, yet without sin. Let us therefore draw near with confidence to the throne of grace, that we may receive mercy and may find grace ot help in time of need. Let your character be free from the love of money, being content with what you have; for He Himself has said, "I will never desert you, nor will I ever forsake you," so that we confidently say, "The Lord is my helper, I will not be afraid. What shall man do to me?" YOU'LL WANT TO RESCUE OTHERS." Who was the father of Azariah? a technique that teaches you how to join with loops. as they may become entangled in the wheels of the chair. 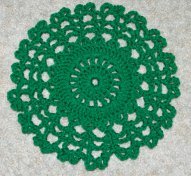 Instead you may opt for a reverse single crochet, a picot style or a shell edging. do you have number 74? Thanks in advance for your help. What exactly does this instruction mean?
" Bobble = (Yoh and draw up a loop. Yoh and draw through 2 loops on hook) 5 times in next st. Yoh and draw through all 6 loops on hook." If I yarn over and pull through the loop on the hook, is that the same thing as "draw up a loop"? If so, I still have only 1 loop on the hook and the next step doesn't work - it says "yoh and draw through 2 loops," but I only have 1 loop to draw through at that point. Now yarn over and draw through all 6 loops. yes but the first instruction only says to yarn over and pull up a loop. you should have the number of loops indicated above after each step. 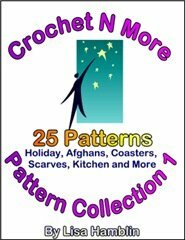 I've run across your Crochet Basics page several times and it's been very helpful. I ran across it again today, and noticed a link to a Geocities site, which now doesn't exist. Thanks so much for letting me know about the broken link. With so many pages it's difficult to keep all links in working order... you're a blessing! and a single crochet in every double crochet. (where do I chain two? and is it a hdc ? So, chain two again, where? and again is it a hdc? I've tried several variations and just can't seem to get it right I hope you can help me out. For this part of Round 1 you join color A with a slip stitch in the upper right hand corner. Those two chains will count as one half double crochet on all rounds. Now work one half double crochet in each double crochet across to the next corner. For the end of Round 1 you work two half double crochet stitches in the corner. Only make two chains where indicated on the rounds. For Round 2, make two chains. 3 half double crochet stitches in the second half double crochet on each corner. Join with a slip stitch in the second chain of the beginning Chain 2 (just like before). Only make two chains when it says to in the pattern. In this pattern, the two chains at the first of a round counts as one half double crochet. I have a baby ballet flat pattern and I get to a certain point and then I'm guessing... which isn't going so well. Row 5 says - dc in next sc (dc next 2 sc tog) 10 times, dc in last sc, ch 2 turn (13 dc), what does dc next 2 sc tog mean? I thought it meant that you yo, put hook through sc yo, come back thru the next hole yo and pull through first 2 then yo and pull through next three but I think that's totally wrong. >> I have a baby ballet flat pattern and I get to a certain point and then I'm guessing... which isn't going so well. For Row 1 you make two chains... then work a double crochet in the stitch at the base of those two chains. Now work two double crochet stitches in each of the next 5 double crochet stitches. Now chain 3. You should have 12 double crochet stitches for this row. For Row 3 you work one single crochet in each double crochet and a single crochet in each chain across. (ch st is a chain stitch... that doesn't mean you make a chain... you are to make a stitch in a chain on the previous row.) If you work a single in each double and in each chain you should have 23 single crochets when you finish Row 3. >> Row 5 says - dc in next sc (dc next 2 sc tog) 10 times, dc in last sc, ch 2 turn (13 dc), what does dc next 2 sc tog mean? NOTE: to double crochet the next two single crochet stitches together you make the first double without completing the very last step... then work the next double without completing the very last step, then yarn over and draw through all of the loops on your hook. >> through first 2 then yo and pull through next three but I think that’s totally wrong. Now yarn over again and pull through both loops on the hook. A Scout Master was teaching his boy scouts about survival in the desert. "What are the three most important things you should bring with you in case you get lost in the desert?" he asked. Several hands went up, and many important things were suggested such as food, matches, etc. Then one little boy in the back eagerly raised his hand. "Yes Davey, what are the three most important things you would bring with you?" asked the Scout Master. Davey replied, "A compass, a canteen of water, and a deck of cards." "Why is that Davey?" asked the Scout Master. "Well," answered Davey, " the compass is to find the right direction, and the water is to prevent dehydration." Davey replied, "Well, Sir, as soon as you start playing Solitaire, someone is bound to come up behind you and say, 'Put that red nine on top of that black ten'." Joy, the lady next door sympathized as my mother complained that her back was really sore from moving furniture. "Why don't you wait until your son gets home?" the next door neighbor asked. "I could," my mother told the lady. "But the couch is easier to move if he's not on it." A general noticed one of his soldiers behaving oddly. The soldier would pick up any piece of paper he found, frown and say: "That's not it" and put it down again. The soldier picked it up, smiled and said: "That's it." A visiting speaker was impressed by the enthusiasm our Christian school students showed in their physical education class. "I exercise, too," he sighed, faintly smiling at our pastor. "Every morning I awaken to the alarm, jump from bed, and run around the block six times." As our pastor expressed surprise and offered hearty praise, the man continued, "Then I kick the block under the bed and go back to sleep." When the driver asked why he had been stopped, the officer pointed to the big dog sitting on the seat beside him. "Does your dog have a license?" he asked. "Oh, no," the man said. "He doesn't need one. I always do the driving." 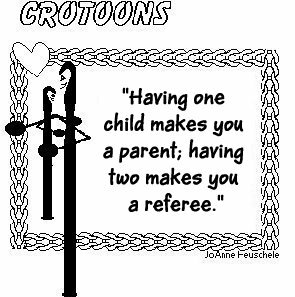 One day on the way home from church a little girl turned to her mother and said, "Mommy, the preacher's sermon this morning confused me." The mother said, "Oh! Why is that? The girl replied, "Well, he said that God is bigger than we are. Is that true?" "Yes, that's true," the mother replied. "He also said that God lives within us. Is that true too?" Again the mother replied, "Yes." "Well," said the girl. "If God is bigger than us and he lives in us, wouldn't He show through?" A doctor is to give a speech at the local AMA dinner. He jots down notes for his speech. "Is there a pharmacist in the house?" Last October my wife bought a magnolia tree from the local nursery, but after only a few weeks the leaves shriveled. It appeared to be on its last legs. My wife took some leaf samples and marched into the nursery to demand an explanation. "I know exactly what's wrong with your magnolia," said the manager. "Good," said my wife. "What's it suffering from?" It was the first time my four-year-old daughter had been to Disney World. She couldn't wait to go on Mr. Toad's Wild Ride. As the car zoomed through the crazy rooms, into the path of a speeding train, and right through walls that miraculously fell away at the last second, she sat clutching the steering wheel, white-knuckled, and screaming. When the ride was over, she looked up at me and shakily said, "Next time you drive. I didn't know where I was going." One Sunday morning when my son, David, was about 5, we were attending a church in our community. It was common for the preacher to invite the children to the front of the church and have a small lesson before beginning the sermon. He would bring in an item they could find around the house and relate it to a teaching from the Bible. This particular morning, the visual aid for his lesson was a smoke detector. He asked the children if anyone knew what it meant when an alarm sounded from the smoke detector. My child immediately raised his hand and said, "It means Daddy's cooking dinner." My mother began getting calls from people who misdialed the similar number of a new computer repair business. Mom, who had her number for years, asked the owner of the company to have the number changed. He refused. The calls kept coming day and night. Finally, Mom began telling the people who called that the company had gone out of business. Within a week, the computer repair company voluntarily changed its number. "John, please wash your hands. My goodness, what would you say if I came into the room with hands like that?" Smiling the boy replied, "I think I would be too polite to mention it."